Dina Kowal Creative: **more** Spring! OK, time to show off some Art Impressions stamps. I had to have this bird when I placed my Art Impressions order - she just makes me smile with her sassy little hat. Tooooooo cute. She's colored with Prismacolor pencils and blended with mineral spirits. There is a little bling on her hat, too. On to the watering can. I decided to try out Art Impressions' new clear stamps. 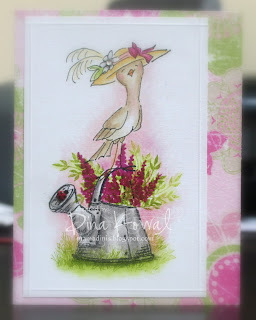 The watering can and the flowers and leaves are all from their Watercolor line. I've eyed that line for some time and resisted so far...because I could tell that if I started buying them and *loved* them, I would just have to keep getting more. Well...they are that fun. The stamps are designed to use with waterbased markers, but I've been using my inkpads and they work that way too - just ink, stamp, and blend a little with a waterbrush or blender pen. So cool. I actually just colored the watering can in with pencils on this one, but I did one for practice with a waterbrush, and it looked really cool. So...oops! Oh, if you haven't watched the clips from the video on Art Impressions' site - you've got to see how easy they make it look to use the watercolor stamps! The background paper is a free download from Scrap Artist called Sanded Florals. You can download it here (sorry, not sure if you have to be a member to see that or not...but you can register for free). There's another brad ladybug, too. I remembered the spots this time! I've since added a buckle closure and a saying to this card, but I thought I'd post it like this - I liked it plain, too, and I'm not sure that I like it better embellished...but it is what it is. :) Thanks for looking! This card is toooooooooo cute! It certainly brightens a day & brings a smile! What a sweet stamp! I love the colors you used - just feels like spring. Completely gorgeous! Wowzers on your coloring!